US Dollar: Sept. USD is Down at 95.090. Energies: Oct '18 Crude is Up at 69.82. Financials: The Sept 30 year bond is Up 6 ticks and trading at 142.05. 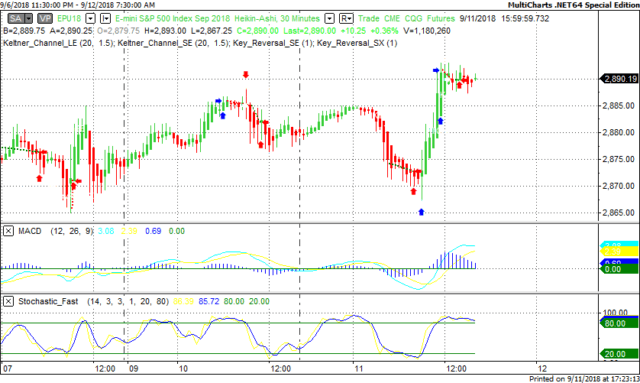 Indices: The Sept S&P 500 emini ES contract is 4 ticks Higher and trading at 2881.25. Gold: The Dec Gold contract is trading Down at 1201.20. Gold is 10 ticks Lower than its close. This is not a correlated market. The dollar is Down- and Crude is Up+ which is normal but the 30 year Bond is trading Higher. The Financials should always correlate with the US dollar such that if the dollar is lower then bonds should follow and vice-versa. The S&P is Higher and Crude is trading Higher which is not correlated. Gold is trading Down- which is not correlated with the US dollar trading Lower. I tend to believe that Gold has an inverse relationship with the US Dollar as when the US Dollar is down, Gold tends to rise in value and vice-versa. Think of it as a seesaw, when one is up the other should be down. I point this out to you to make you aware that when we don't have a correlated market, it means something is wrong. As traders you need to be aware of this and proceed with your eyes wide open. At this hour Asia is trading Mixed with half the exchanges trading Lower and the other half Higher. Currently all of Europe is trading Higher. FOMC Member Brainard Speaks at 12:45 PM. Major. 10-y Bond Auction starts at 1 PM EST. This is major. Beige Book is out at 2 PM EST. This is major. Yesterday the ZB made it's move at around 8:30 AM EST. The ZB hit a High at around that time and the YM hit a Low. If you look at the charts below ZB gave a signal at around 8:30 AM EST and the YM was moving Higher at the same time. Look at the charts below and you'll see a pattern for both assets. ZB hit a High at around 8:30 AM and the YM was moving Higher at the same time. These charts represent the newest version of MultiCharts and I've changed the timeframe to a 30 minute chart to display better. 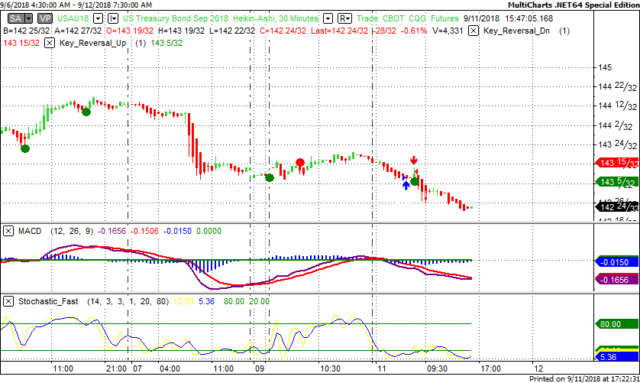 This represented a Shorting opportunity on the 30 year bond, as a trader you could have netted about 15 plus ticks per contract on this trade. Each tick is worth $31.25. Charts Courtesy of MultiCharts built on an AMP platform. Yesterday we gave the markets a Neutral bias as the instruments we track showed no sense of direction Tuesday morning. The markets had other ideas as the Dow gained 114 points and the other indices gained ground as well. Today we aren't dealing with a correlated market however we will maintain a Neutral bias.